The American Dream is to be rewarded for your hard work, so that’s what we’re doing for you. 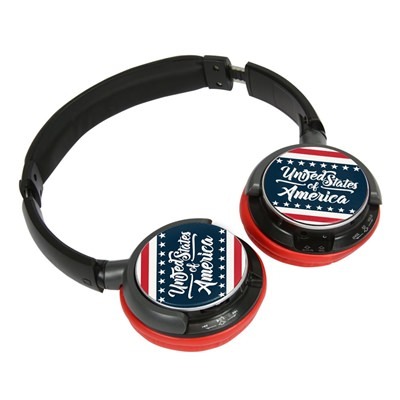 For a qualifying purchase, you will receive this black and red USA Flag Sonic Jam Bluetooth headphone set! Compatible with most Bluetooth devices (like your phone or your tablet) you can listen to your music and media wirelessly! No more wires or cords to get caught in the door, you can jam away to your favorite tunes sporting this trendy headgear emblazoned with the stars and stripes. The charging cable is included but you won’t be wasting much time charging these babies, they have an exceptional battery life. With swivel ear cups and an expandable headband, we hope you’ll have a comfortable, well earned jam session!